Brigandine of English archer was widespread in the XV century. It was used as by archers, so crossbowmen and foot soldiers. This light model is very comfortable and does not hinder the movements. Please pay attention that design of this brigand body protection is unappropriated for fight! 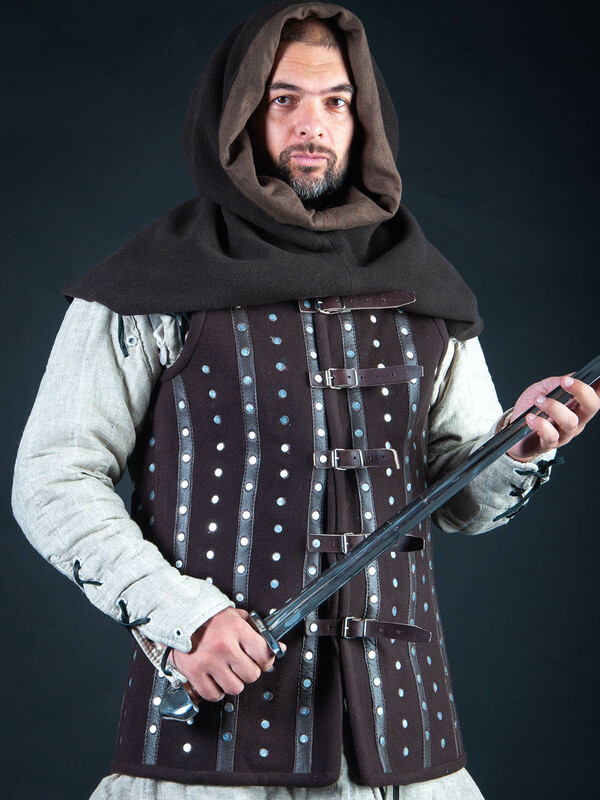 Made-to-measure brigandine armour is completely handcrafted. We use plates 5.5*3.5 cm for this model. Plates are placed vertically without overlapping. Distance between vertical rows of plates is 2.5 cm. There are leather straps (sewn and riveted) of width 2 cm between the rows of plates. 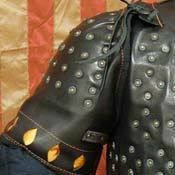 Additional options allow you creating of unique model of English medieval armour, as such body protection pointed out social status of owner. Rich knights were wearing brigandines with leather, velvet or suede cover, with bronze buckles and beautiful decorations. At the same time, poor soldiers were using body armour made of wool with simple leather straps. There are a lot of various fastenings and types of decoration for your brigand armor. If you choose half-coloured or quarter-coloured brigandine, please inform us via [email protected], what colours you prefer and its exact disposition. Light and comfortable brigandine for LARP and staging might be interesting for you as well. 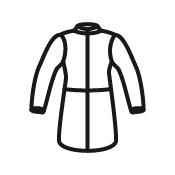 We strictly recommend to wear brigandine only over padded gambeson. Brigandine arms and legs protection will complete your body protection. In section “Brigandines”, you can see all models of brigandines for sale. If you didn’t find any for your taste, wish and needs, please send us photo and description of the required model and we will make it for you. Large-plate brigandine was used preferably in the XIV-XV centuries. Knights from all military branches were wearing similar model of body armor. You can use this brigandine armor for: SCA HEMA Larp Stage performances Medieval festivals Reenactment events Made-to-measure brigand body protection is completely handcrafted. Our artisans use individual parameters and regards of customer for manufacture. Design of this brigandine is notable for the use of large metal plates from the front and back. Base price includes following options: Black wool for outer shell; Cotton for inner shell; Plates of cold-rolled steel 1.0 mm; Steel finding rivets; Black leather straps; Steel nickel-plated buckles; Straight bottom edge; XS-size In options, we offer you to choose type and thickness of plates, for example, cold-rolled or stainless steel, or titanium. 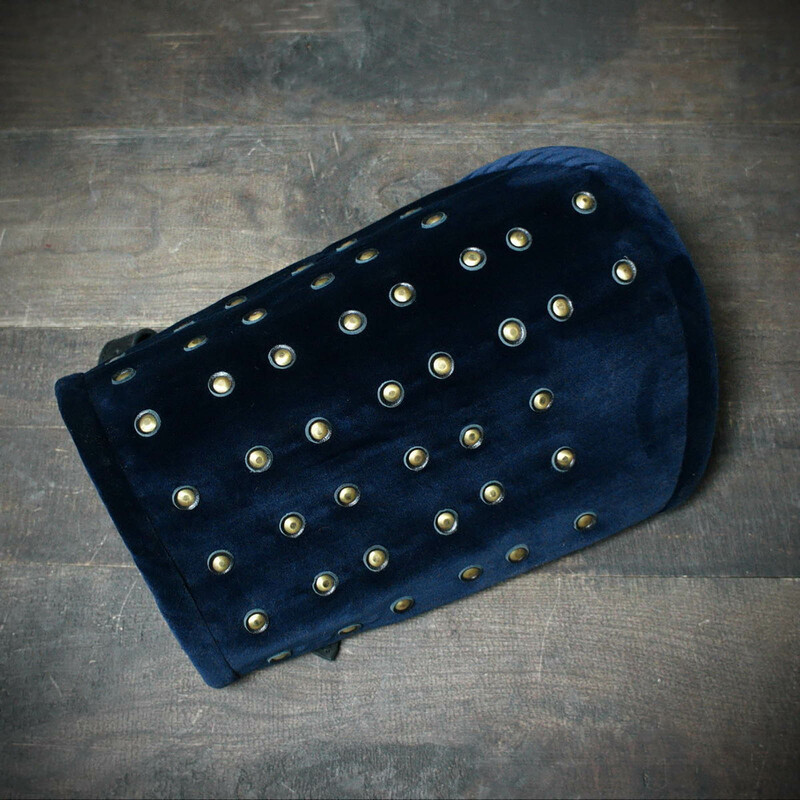 Such materials, as leather, velvet or suede of different colours are available for order. If you choose half-coloured or quarter-co..
Brigandine armor was widespread among all military branches in the Middle Ages. Nowadays, this body protection is popular among reenactors and fans of history. It is suitable for usage by men and women. This model of brigandine does not have riveted plates for protection of body during the fight with heavy weapon. 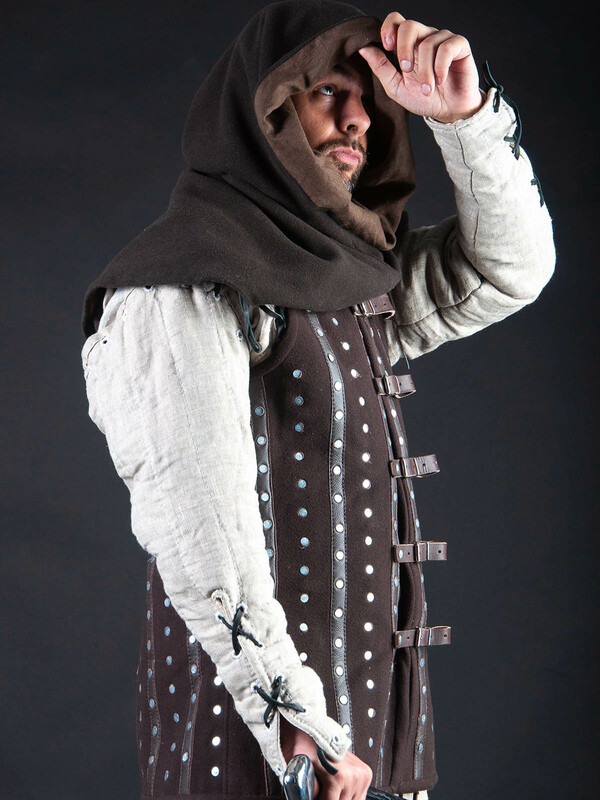 But, this light armor is perfect for: LARP; Stage performances; Medieval festivals; Reenactment events Made-to-measure brigandine armour is completely handcrafted. We use client’s parameters for manufacture, so every item has perfect fit. Base price includes following options: Black wool for outer shell; Cotton for inner shell; Round washers of cold-rolled steel 1.0 mm; Steel finding rivets; Black leather straps; Steel nickel-plated buckles; Straight bottom edge; XS-size Additional options allow you to create unique model of body protection. We offer firm leather or fine velvet for outer layer. Different colours of materials are available for order. There are a lot ..
Chalkis (Chalkida) is town on Greek island Euboea, which was Venetian settlement in the 1209-1470 years. Large-plate brigandine was found in the Castle of Chalkis, and had taken the same name - Chalkis brigandine. European knights were using such brigandine from the 80’s of the XIV century to the early XV century. Now fragments of brigandine are kept in Metropolitan Museum (New York, USA). This model of medieval brigandine with skirt is very popular among modern reenactors of the XIV-XV centuries, because of few benefits: Such brigandine is easy in making; It is very comfortable plates’ armour. 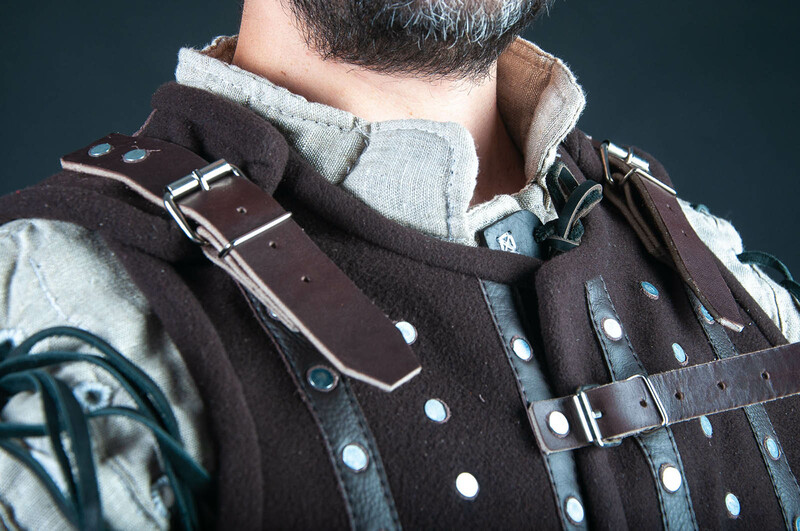 Leather belts with steel or brass buckles on the shoulders and from the front allow easy wearing without exterior help; Brigandine has high protective properties. Plates of brigandine cover almost full body without leaving of any gaps. At the same time, this body armor does not restrict movements during the fight You can use this brigandine armor for: SCA HEMA Larp Stage performances Medieval festivals..